A good comedy is damn difficult to review. You can say something is hilarious, rib-tickling, smirksome, chortleworthy and so on, but you're just repeating yourself - how many different ways can you say something is plain funny. If you begin to describe the best bits then you're spoiling the punchline and dissecting why it's funny feels like you're missing the point a bit. 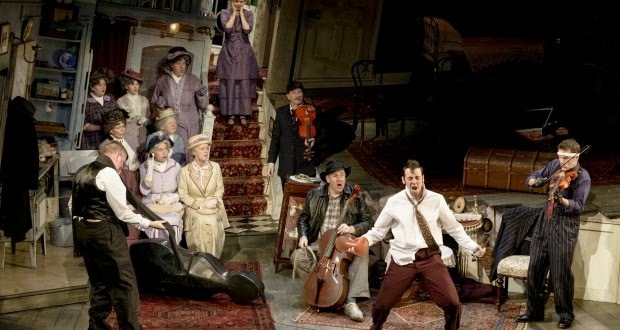 But yes, The Ladykillers is funny. Funny, funny funny. This is an adaptation of the funny 1955 Ealing Studios film of the same name starring the very funny Alec Guinness. The writer for this stage version is TV funnyman Graham Linehan writer of Black Books (very funny), Father Ted (very very funny) and The IT Crowd (..... sporadically funny). The play, a farcical black comedy, centres around a sinister criminal gang out to rob a security van from Kings Cross Train Station. They need a place to hole up as they execute their scheme, and chance across Mrs Wilberforce, an eccentric old widow, who lives alone in a lopsided knickknack filled house. Posing as a string quartet, the leader of the gang, egotistical criminal mastermind Professor Marcus, begins to plan a big job. His partners in crime are the dimwitted giant One Round, old-school ruthless gangster Louis, transvestite con-man Major Courtney and the manic, dexy-popping East End kid Harry. As their diabolical deception grows ever more complex the men realise that they might have not only have underestimated each other's avarice but more also the moral fibre of sweet old Mrs Wilberforce. The plot, originally devised by screenwriter William Rose, is a masterpiece of clockwork ingenuity. The situation spirals into farcical disaster yet never feels contrived or particularly far-fetched. Even as the gang begin look at each other with murder in their eyes we still fundamentally like everyone on stage, each of their fates pre-ordained with such gossamer light writing that we're laughing even as they thump into the passing Newcastle Goods train. One of the reasons I enjoy the play (and film) so much is that it feels like a peek into a perfect karmic world. Every immoral action committed by a character bounces back in their face, creating an intense comedic whirlwind as the situation escalates beyond the gang's control. Innocent Mrs Wilberforce sits serenely in the eye of the storm, her simple unbending morality and basic goodness a brick wall against which evil fruitlessly hurls itself. Though she's surrounded by ruthless criminals we instinctively know that no harm is going to come to her, she's under the protection of benevolent Gods. 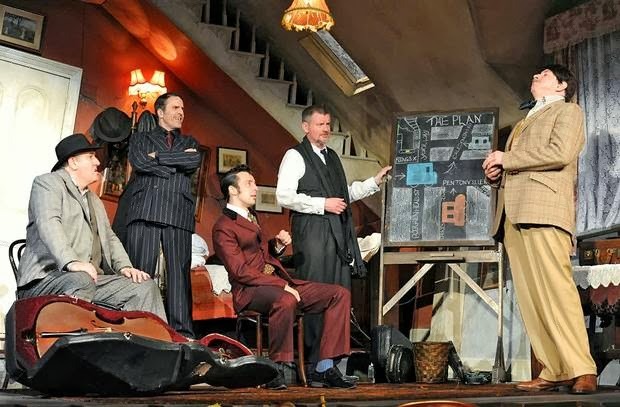 As the vast majority of The Ladykillers takes place in one location it's a perfect fit for the stage, and this set is absolutely magnificent. Mrs Wilberforce's house doesn't have a straight edge in it, everything is collapsing and cracked. Trains rumble past all the time, vibrating everything in the house - the contents are rigged up to wander around as the gang look on in bemusement. This movement makes the place seem alive, and it's a rare treat to see a production where a coffee table has great timing and a genuine comic presence on stage. As the action moves around the set rotates like a puzzlebox, twisting and transforming to reveal the outside walls. These intricate mechanics are impressive enough in their own right, but as a facet of a well-oiled clockwork comedy they also feel totally appropriate. Throughout the first half I was wondering how on earth they were going to stage the robbery in Kings Cross - eventually coming to the conclusion that it'd probably just take place off stage. To my delight the robbery was depicted with toy cars that climb on invisible roads around the scenery, pursued by miniature police cars. But perhaps the most impressive moment, which I won't spoil, comes towards the end, when the set rotates to reveal a completely different environment that's only on stage for a few minutes, yet impresses with its sheer scale. The performance I was invited to was an understudy show and though there were a few slight wobbles I can't imagine the main cast being much better than this. Slightly annoyingly there doesn't appear to be a cast list online for these understudies, so I can't single anyone out for specific praise, though the actor playing Mrs Wilberforce was just about perfect, as were whoever was playing One-Round and the Major (if anyone knows who they are, comment below!). Unfortunately (and I don't mean this as a slight on the actor) Professor Marcus felt a bit off. Alex Guinness leaves big shoes to fill and without his sinister, lidded grin the character is diluted. Rubbing a touch of salt into the wound is the knowledge that Peter Capaldi was playing this role when the production premiered, leading me to wonder throughout how he would have handled this character. I know I should judge the performance on stage rather than the one in my head, and though there's an attractive Terry Thomasish quality to this interpretation, it felt 'off': Marcus feeling like more of an engine to move the plot along rather than the centre of the comedy. But hey, being invited along to see a production of this quality makes me feel a little ungrateful to criticise the performances. From the make-up of the audience I'd guess that they'd also invited some local schools along - the majority of the audience appearing to be about 11. You do wonder if 11 year olds are going to appreciate a farce set in the 1950s, but they laughed and clapped the more it went on, eventually cheering happily as the curtain went down. 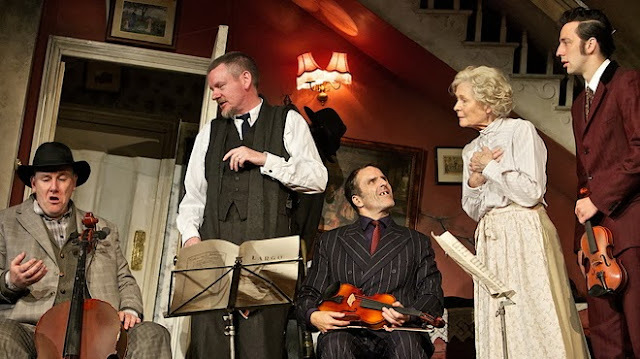 The Ladykillers is a fantastic adaptation, Linehan's script tight as hell, the staging imaginative and most importantly it's really, really, really funny. What more could you want? 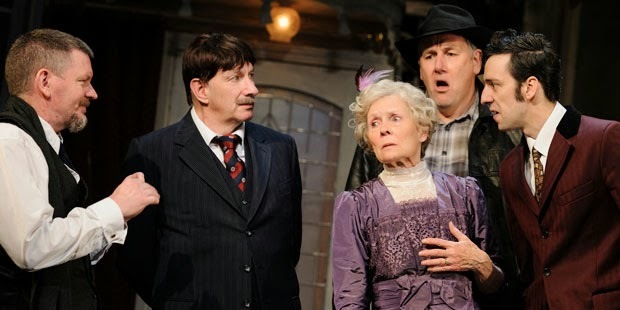 The Ladykillers is at the Vaudeville Theatre until 16th November 2013. Tickets available here.